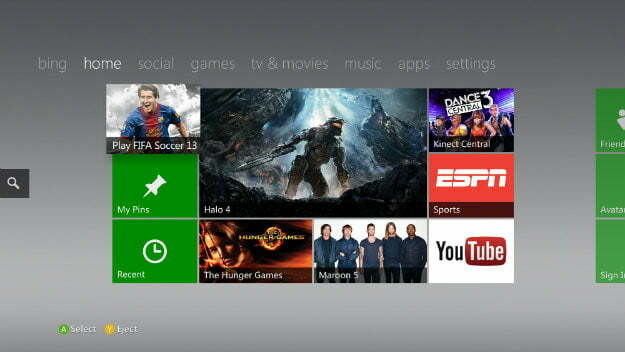 Microsoft is brewing up a fairly quiet storm for its Xbox 360 business this year. This week brought many announcements and new releases for the company’s console, identifying it even more with entertainment of all stripes rather than just video games. There was an Xbox 360 price drop to $250, Xbox Music opened for business, and now comes the new Xbox Dashboard update, a release that finally brings Internet Explorer to the seven-year-old machine. Larry “Major Nelson” Hryb, the director of Xbox Live, announced via his blog that Microsoft is releasing its latest update for the Xbox 360’s proprietary interface starting Tuesday. Roll out is a more appropriate term than release, though, as not all regions will be able to download the update immediately, and it may take until November for it to be available in all regions. In addition to Internet Explorer, there are a number of other changes coming to the Dashboard, including improved search tools, the ability to customize your Dashboard front page by “pinning” your most used apps and services to the front, and the rebranding of the Zune Video Marketplace as Xbox Video. Xbox SmartGlass support isn’t officially a part of this update. That won’t be released until Windows 8 hits on Oct. 26. None of these changes are system sellers. Microsoft isn’t going to get people lining up on Black Friday because its downloadable video store has a new name and there’s a web browser on its gaming console. This Dashboard update will, however, make Microsoft’s myriad services a more uniform and understandable across its platforms. This update will bring the console ecosystem in line with where the Xbox brand is on phones, PCs, and tablets. Microsoft will have to work hard not to frustrate consumers though. Internet Explorer is a potent tool for the Xbox 360, not for basic web services, but for its potential access to video entertainment. Microsoft will obviously block users from accessing video websites like Hulu, though, forcing them to pay for an Xbox Live Gold subscription so they can use Xbox-based apps. This Dashboard update, and its place in the larger Microsoft entertainment business, is only a half step. The company needs to drop Xbox Live Gold next, and make these web services free across its platforms, or it won’t be able to compete properly with Apple. Gibbs Quadski: Redefining the meaning of "all-terrain vehicle"